Avocados are everyone’s favorite fruits! They are simply irresistible and delicious and we simply love them. The fruit can be simply added in anyone’s daily diet as a separate dish or for flavoring. However, only some of you may know that the avocado tree can be planted and grown at home. 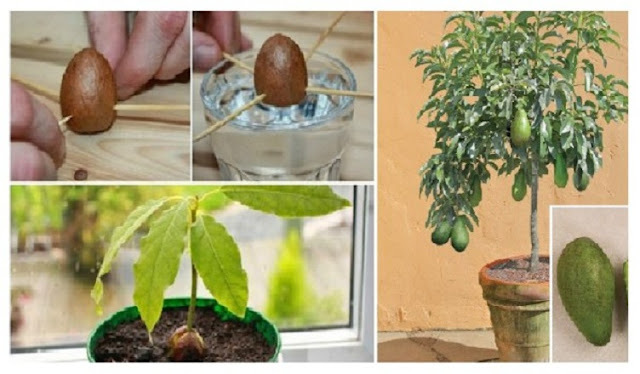 So, when you are about to slice an avocado for guacamoles or for a salad, keep the seed because you will need it if you want to grow your own avocado tree. People who live in warm and sunny regions use this fruit regularly, but northern gardeners need some advice for growing avocados at home because they are prone to be harmed by frost and cold. First of all, extract the seed by gently removing the pit from the flesh of the avocado. Wash it clean or soak the pit in some water for a couple of minutes and then scrub it to eliminate all remains. Note that you should keep the seed cover or the brown skin of the pit. Then, pierce it. All avocado pits have two ends, its top or the end from which the sprout grows, and its bottom, from where the roots grow. The top is the part which is a bit pointier, and the flatter one is the bottom. Put the bottom in some water In order to stimulate it to sprout. Afterwards, firmly wedge in some toothpicks. Stick the toothpicks pointing down in order to leave a larger part of the avocado base soaking. Leave the seed to sprout for 3-6 weeks. After this period, you will notice a sprout coming out from the top and roots at the base. When the stem is grown for about 5-6 inches, you should pinch out the top set of leaves, and after a few weeks, expect to have new leaves and no more roots. The sprout tail will be around 6-7 inches after some time and then you should trim it in half in order to stimulate new growth. When the whole process is finished, take a large flowerpot (for instance, 8″ to 10″ across) and place some enriched potting soil to about an inch from the pot’s top. Place the pit in a small hole in the center, but put it with the root-side down. In order to water the pit, you should water the soil generously as it needs to be moist all the time.